If the ruling Bharatiya Janata Party (BJP) returns to power two months from now, piggybacking the armed forces, one central fact will be eminently clear: The optics of a powerful military with high morale belies the ground reality. The Government has misled the country on defence modernisation and preparedness through high-decibel claims and self-praise for its devotion to the soldier. Never before has any Government milked the success of military operations for political and electoral gains as the present one and successfully politicised the armed forces. The creation by it of nationalist sentiment and allied jingoism through coopting sections of the print and electronic media and their armies of supporters and cheerleaders has diverted the focus of elections from Achche Din and Sabka Saath, SabkaVikas to national security and taking the mickey out of Pakistan. Last Sunday, the BJP launched a blitz of victory rallies in Uttar Pradesh, pitching the forthcoming elections as a means of rooting out terrorism and defeating Pakistan. Citing Balakot air strikes as the Government’s “befitting reply for Pulwama”, its leaders said that only a Government led by the charismatic and decisive leader, Narendra Modi, could guarantee the country’s defence and security. Part II of this self-congratulatory boast is the caustic criticism of Opposition parties, mainly the Rahul Gandhi-led Congress, for questioning the Government and the Indian armed forces on their claims of targetting, damage assessment and casualties. Balakot has become the magic wand for winning the Lok Sabha polls. 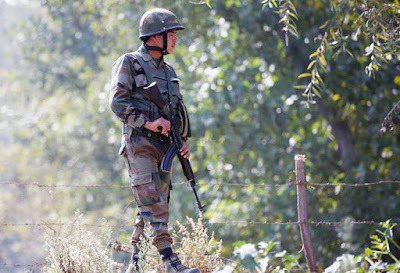 In 2016, following the Uri terrorist strike, modest ground surgical strikes were magnified to being the silver bullet for ending cross-border terrorism and, therefore, employed liberally to show-case the Government’s determination to teach Pakistan a lesson. They were cited extravagantly to win the Assembly elections in Uttar Pradesh and Karnataka, to name just a few. Banners and posters using serving Army officers’ pictures alongside Government leaders politicised the military. Surgical strikes were liberally replayed to deify the BJP leadership, principally Prime Minister Modi. The Army’s resolute stand at Doklam was also appropriated by the Government as its own dogged action of thwarting China in its attempt to present Bhutan and India with a fait accompli. In all the three military operations — Operation Surgical Strikes, Operation Juniper and Operation Balakot — the Army and IAF came out as winners but it was the Government which super-imposed the “lotus” on them. This is the great irony as the Modi Government apparently attaches minuscule importance to the Defence portfolio, posting four Ministers in five years. The last of these, Nirmala Sitharaman, is a first-time MP, who has spent her prime-time defending Modi on Rafale in and outside Parliament, whereas traditionally, the Defence Minister is invariably a political heavyweight. Union Finance Minister Arun Jaitley was twice a part-time Defence Minister and is not known to be terribly sympathetic towards the military. The most effective and committed was the late Manohar Parrikar whose pledge to appoint the Chief of Defence Staff (CDS) was unfortunately killed by the Prime Minister’s Office. This coupled with the musical chairs in the Defence Ministry allowed National Security Advisor (NSA) Ajit Doval to become de facto CDS and also interfere in key issues of the Ministry like Rafale. Policeman Doval is the first NSA to become directly involved in planning and conduct of operations, notably Pathankot, which is in the remit of a military professional. His appointment as Chairman of Defence Planning Committee is another first and needless padding to planning. The Doval empire is enviable. Under Jaitley, defence funding etched an interesting trajectory. After his second budget, his reasoning for limited capital funding for modernisation was that the military is unable to spend even what little is allotted. The following year, Jaitley changed tack, saying that actually, he did not have the money to increase the capital account. The interim budget presented this year by acting Finance Minister Piyush Goyal earmarked the lowest amount in memory for modernisation with the staple byline, “more funds will be provided if required.” At a national security conclave last month, Jaitley said that hike in modernisation funding will depend on paying off committed liabilities and that any increase would be contingent on income from widening the tax net. This year’s allocation may fall short of even accounting for committed liabilities. Still, BJP president Amit Shah raved about the current defence budget as a milestone having crossed the Rs 3 lakh crore mark, more than 70 per cent of which is revenue expenditure. The true reflection of the state of defence funding and operational readiness was provided by the BJP’s own chairman of the parliamentary standing committee on defence, Maj Gen BC Khanduri, who rated defence allocation of 1.5 per cent of GDP as “disabling war preparedness.” His blunt inference led to his removal and replacement by party veteran Kalraj Mishra. Just as well that Balakot did not escalate into a short and intense conventional war as ammunition, tank, artillery and night-fighting equipment inventories are critically hollow, not to mention the plummeting decline in Air Force squadrons from the authorised 42 to below 30 squadrons, actually around 26 squadrons (Air Chief Marshal AY Tipnis at last month’s security conclave). No Service Chief should have to say “we will fight with what we have” as Air Chief Marshal BS Dhanoa had to. Government putting the soldier on a pedestal. India’s military is overly obedient with high tolerance threshold in civil-military relations. Service chiefs have not taken an issue-based stand individually or collectively. A professional, secular and apolitical military is being progressively politicised and utilised for advancing electoral prospects of the ruling establishment in the guise of promoting nationalism. Questioning the military and the Government on this is kosher.